The Beauty of Life: Clinique Rescue Balm with Aloe Really Saves the Day! Clinique Rescue Balm with Aloe Really Saves the Day! So you know how sometimes even though you apply sunscreen liberally to your entire body, you still manage to get sunburned? Such was the case on this beauty chick's recent vacation. Even though I used SPF 70, I was still sunburned pretty darn badly. And while I've got some products in my arsenal that usually do the trick, I knew this sunburn really needed some extra-special TLC. That's where Clinique Rescue Balm with Aloe came in. I honestly love everything about this lotion. Let's start with the bright and sunny yellow packaging. How can you be sad about applying moisturizer to a sunburn when it comes inside such a happy-looking tube? I'll answer that question for you ... you can't! And inside is something even more delightful -- a bright minty-green cream that soothes, softens and otherwise smooths a painful sunburn. This cream -- I'm calling it a cream, not a balm, as I think it's much richer and lusher than a balm usually is -- has seriously been the gift that keeps on giving. Not only did it ease the painful redness and make it disappear faster than I would have ever thought possible ... but when the inevitable peeling started, it was right there to make that disappear immediately too! We're talking within 24 hours. And that is much quicker than I've ever seen a sunburn and the requisite peeling leave my lifestyle before! Intrigued? Well, why wouldn't you be? You should definitely pick one up for yourself IMMEDIATELY IF NOT SOONER. 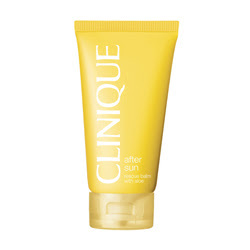 Clinique Rescue Balm with Aloe is $23 at clinique.com.